Incumbent must be able communicate impeccably via written content and assist with whatever is required by the Office of the President to the lead up to HU’s first convocation. Habib University in partnership with Sajjad Foundation and other donors shortlist and sponsor students from all over Pakistan who attend the Summer Program at National University of Singapore. Conducted over two weeks, this residential program offers a unique opportunity for students to learn how public policies are formulated and gain important insights on business practices and entrepreneurship development in Singapore. The candidate will be required to assist with all activities undertaken by the QEC office related to University and Programmatic accreditation. 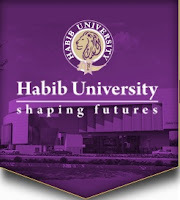 The Office of Admissions play a vital role in the larger mission of Habib University. The Office of Admissions is responsible for managing the entire admissions process efficiently and smoothly providing support to each student at various levels of the admissions process. The University Registrar / Director of Academic Systems provides leadership and management for the Office of the University Registrar, ensuring that services to the academic units, faculty, students and other stakeholders related to enrollment and academic records are delivered accurately, professionally and in a timely manner. The Director of Academic Systems/University Registrar is a highly visible department leader, collaborating and sharing information with an extensive group of internal and external participants. We need a collaborative leader in this role who brings expertise in Records and confidentiality best practice, the ability to communicate succinctly to influence across lines of authority, and an active and strong equity lens to this work. The incumbent will ensure the integrity, accuracy, and security of all academic records of current and former students; facilitate effective student registration and enrollment; build secure student data files and set policy and procedures for their responsible use; maintain up-to-date course schedules, catalogs and final examination schedules; and manages efficient use of classrooms. The Office of Academic Operations is responsible for facilitating recruitment of faculty, faculty annual review and promotion, professional development, faculty policies and assisting the Vice President and Deans on all faculty matters as needed. The Director will supervise a small team, and will work with Office of Human Resources, Office of Travel Services, Office of Marketing and Communications, Office of Global Engagement, Office of Institutional Research, Centre for Pedagogical Excellence and Office of Facilities Management. Academic advising is the process through which Habib University provides the necessary resources for students to make good choices. The primary purpose of academic advising is to assist students as they develop meaningful educational plans compatible with their life goals. The role of the Academic Advisors is to engage the student in integrated advising (prescriptive, developmental, and appreciate). Although the curriculum is well defined, there will be opportunities, both within and beyond curricular constraints, for students to participate in courses and activities that support their academic and personal development. They will ensure that the student is on the right trajectory towards completion. top tier universities and liberal arts colleges, with Yohsin as a core principle of teaching excellence. The Quality Enhancement Cell (QEC) has been established for the review of quality standards and the quality of teaching, learning and management at the University along with liaising with HEC-QAA (Higher Education Commission- Quality Assurance Agency). The QEC at Habib University resides under the Institutional Effectiveness and Student Affairs Division. The individual will be responsible for providing computer and related technical support for SSE’s labs as well as courses. The position frequently requires liaising with the IT department. The incumbent will be responsible for the planning and implementation of strategy in order to reach out to potential Habib University Students, for the assigned group of schools. S/he will be part of designing and executing a variety of activities including school specific communication, school visits, organizing and attending education expos, conducting student workshops and parents’ sessions in order to facilitate relationship building and raise awareness about the university. S/he will also be involved in devising various other plans to engage students in order to give them insight about the university. S/he will also be responsible for creating and maintaining relationships with key stakeholders of the assigned schools. Habib University intends to develop and nurture an organic, proactive and constructive relationship with its alumni for realizing its vision and continuing contribution to societal development and improvement. The spirit of philanthropy has a transformative effect on HU’s creation and ability to deliver high-quality teaching and learning programs to students irrespective of their economic capacity. HU expects its alumni to have inculcated the same level of generosity, and actively contribute to providing quality higher education to future generations. The incumbent will be responsible for devising school specific recruitment campaigns in order to recruit students according to student profiles set by the institution. They will also be responsible for relationship building with the school principals and counselors. S/he will represent Habib University at educational expos, open houses and other relevant events on national and international platforms. Furthermore, the candidate will be responsible for collecting, analyzing and synthesizing the data related to students’ academic and career choices and for Higher Education. They will be responsible for surveying students’ perceptions to evaluate effectiveness of the individual strategies and overall recruitment campaign. Incumbent will be responsible for handling the digitization of prospective students’ data. The Intern will help in communicating with potential HU students for recruitment while keeping a log of all communications made, especially the comments gathered over the telephonic communication. Furthermore, S/he will be responsible for assisting with all other recruitment activities. The candidate will be required to draft communication materials, create presentations and work with the Office of Resource Development towards conducting events and managing campus visits. Candidate may be expected to do other tasks as directed. The incumbent will be responsible for creating and implementing learning programs, digital services for supporting student’s research and learning. The incumbent will also oversee implementation of Open Source Online catalog, Digital Repository, Subject guides, Website and enhance them as per need and requirements. The incumbent will also interact and collaborate with faculty members for course, research and subject guides, information literacy programs and workshops. Director of Student Life will design and implement engaging co-curricular, non-credit programs and activities focused on building leadership capacity and a vibrant, inclusive student body. The incumbent is expected to provide strong educational, social, and leadership development oriented co-curricular programs and activities to enhance student learning at Habib University via the principles of the Yohsin philosophy – striving for Excellence; appreciating Beauty; nurturing Passion; Respecting others; and Serving the community around us. The incumbent will be responsible to assist in responding to funding opportunities for its programs within Habib University and in researching, writing grants, and securing funds to support various University education initiatives. The Grant Writer is primarily responsible for developing and writing grant proposals to foundations and other grant-making organizations, and will persuasively communicate Habib university ‘s mission and programs to potential funders. This Manager of Resource Development serves as the chief fundraising strategist for Habib University and is responsible for all aspects of resource development including the development and execution of workplace giving, major gifts, corporate relations, planned giving and raising funds for the University. Coordinator, Center for Pedagogical Excellence (CPE) is responsible for assisting in the analyses of academia training needs, developing curriculum and where required delivering courses. The training coordinator shall further assist his/her supervisor in in evaluating the trainee for effectiveness of training and individual employee growth. And shall also be responsible for development of reporting for measurement of training needs and results. The Manager for Campus Community Development will be responsible for developing a safe and welcoming campus environment for student success based on the Yohsin principles of service, respect, passion, beauty and excellence. The Manager will provide a leadership role in the development and implementation of university-wide policies, procedures, trainings and education related to student conduct. S/he will also be responsible for managing and maintaining student conduct issues. To apply for any of the positions mentioned above, kindly fill in the Application Form and submit it along with your most recent resume. You can also fill in the Application Form if you feel that our current staff openings are not relevant to your qualifications or expertise. We will be keeping your information in our database for a period of 12 months and contact you whenever there is an opening that matches your profile.